eShakti is a unique women's apparel store online that allows custom changes in the style of the garment - sleeve, neckline, length can all be changed by the customer to her preference. 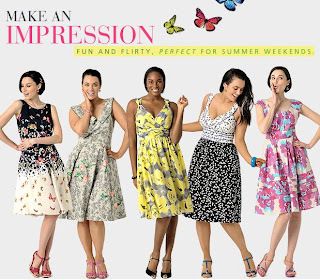 eShakti offers a full size selection from size 0 - 26W and custom sizes too. They offer designer women's clothing, including dresses, tops, skirts, fashion jewelry and more. Unlike other stores, their items are never out of stock. All the hottest colors of the season, in every product and style and in every size is always available. The special appeal of their designs are the embellishments they allow via print, embroidery and fabric texturing. So it's designer-wear that is not readily seen or available in stores. If you're looking for a fun summer dress or top, something to wear to a wedding, or a new outfit for work - check them out! I guarantee you're going to find something you'll love! "Shakti means 'power' in Sanskrit. eShakti therefore means the Power of the Net. We believe the internet empowers customers and helps companies be customer-centered."